If tooth decay is not taken good care of, the bacteria may reach the nerve and cause infection. This infection is painful and can damage the whole set of teeth. Root Canal Treatment is essential to save the natural tooth which otherwise will have to be removed. There is no alternative to Root Canal Treatment. Our world class technology like Apex Locators and Rotary Endodontics ensure you get the most precise and efficient treatment possible. We specialise in retreatment of failed Root Canal Treatment in South Delhi at Green park Dental. Root Canal Treatment is often thought to be painful. Depending on the degree of infection, the treatment may need one or more sittings for completion. Mild discomfort can be felt for 24-48 hours post the treatment. We use highly accurate technology to rule out possibility of any relapse. Permanent Filling is put only once we are certain there is no infection left. Local Anesthesia is used in the treatment and hence precautionary instructions are to be followed for the next 3-4 hours. No solution is better than saving your natural tooth. We recommend Root Canal Treatment over dental Implants, whenever possible. The minimal pain involved in the treatment helps you get rid of the unbearable pain caused otherwise. Root Canal Treatment can fix aesthetic issues that may arise due to decay, crack etc. Infection in the tooth can spread and affect the overall health of the body. If untreated, the infection can spread to the gums and even the other parts of the body. Root Canal Treatment is one of the most essential treatment when it comes to saving damaged tooth. Relapse of the infection can cause failure of the treatment. We have an experienced team of endodontists who are well equipped with the right technology to help you get the most precise care. 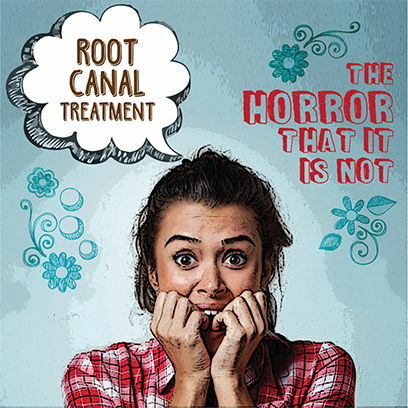 If you are looking for root canal treatment in south delhi, speak with our specialists today.